Data is your company’s most valuable asset. 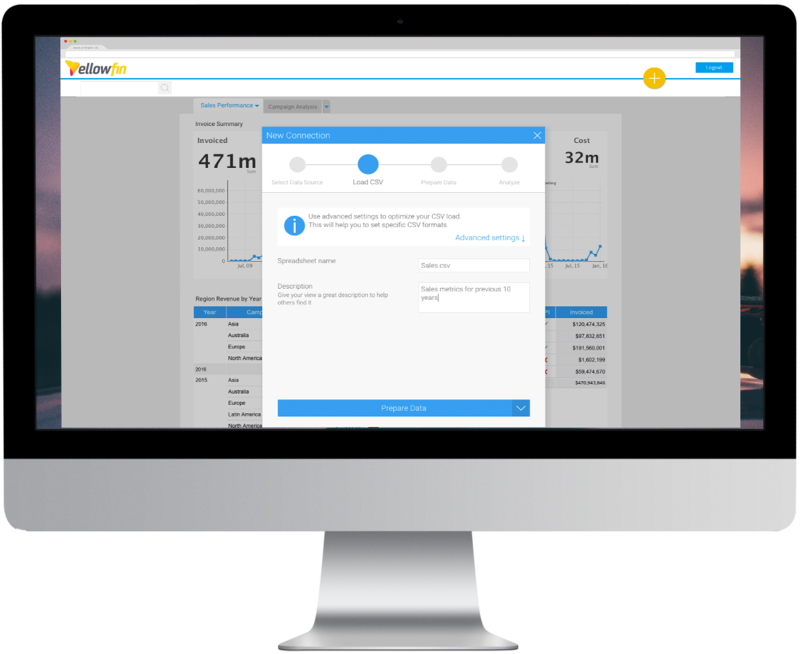 That’s why Yellowfin makes it easy for you to connect to all your enterprise data sources, wherever they are, from one platform. Even blend data – from databases, to spreadsheets and your favorite Web applications – to generate new insights. Create a single source of the truth for your entire organization. Connect to and query all your relational and cube data sources directly – in real-time. Managing access to your varied data sources can be a headache. It's rare that you can access your OLAP, relational and CSV data sources through a single and easy-to-use BI solution. Well, with Yellowfin, you can. Connecting to your favorite Web applications is now as easy as connecting to your on-premise databases. Create, share and act on analytical insights from your most important third-party Web apps with out-of-the-box dashboards and reports for Salesforce, Xero, Google Analytics, Zendesk, Twitter, YouTube and more. Yellowfin treats your spreadsheets as just another data source. Quickly and easily combine CSV files with other data types to create a single, up-to-date and accurate version of the truth. Avoid the frustrating limitations, delays and error-prone nature of Excel reporting. Use your spreadsheet data to create stunning visual analysis and interactive reports in minutes. Discover insights in mountains of data. Connect directly to your Big Data sources and perform lightning-quick analytics.